Former and new Greece Coordinator! After almost two years our Greece Coordinator Valentino Velasquez is back in Switzerland. Georgia Kaltsidou has taken over the coordinator role in Greece. Georgia has been working for several humanitarian organisations in and around Sindos since 2015 and came on board when Sindos Community Centre (SCC) first opened. We are very happy to have someone like her on our team; she has a wealth of experience, extensive knowledge of the displaced community and is a local from Sindos. We have made the important decision to register as “Be a Robin” in Greece. This is a big and costly step, but we consider it a necessity. We regard it as a silent sign of commitment towards the people we work with here in Greece. Due to the well participated activities and the positive feedback we are highly motivated to continue these collaborations in order to spread knowledge and experience. Further we had to two private donors coming from the United States to renovate and refurbish the SCC for two weeks. They generously invested several thousand Euros for which we are very grateful! What do we need at the moment? At last we want to thank our Partners IsraAID, Three Peas and Catch a smile asbl. and all the magical people out there, supporting us along the way! 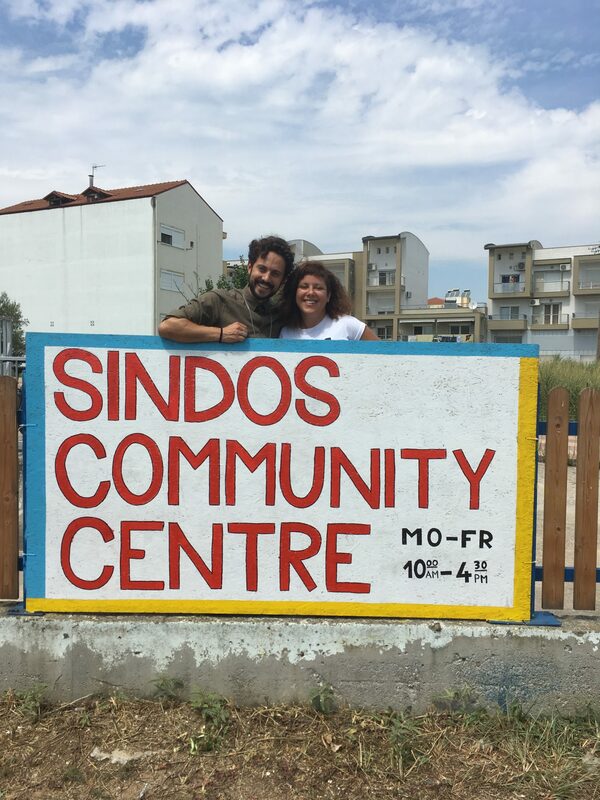 As of April 2018 Be a Robin, in collaboration with IsraAID and Three Peas, is in charge of the Sindos Community Centre in the outskirts of Thessaloniki. The Community Centre (SCC) serves the displaced population of Sindos (over 300 people) as well as the local population. Daily visitors are mothers with children, elderly people and young folk looking to spend their leisure time together. The SCC is open daily from 10am to 5pm, from Monday until Friday. The visitors of the Centre have access to Internet, coffee and tea, a laundry machine and the activities offered by Be a Robin and our partner organisations. Each afternoon there are Greek, English and German classes for different levels. We would like to focus more on educational activities of all kinds at the SCC without taking away the inviting atmosphere for people to simply come and hang out, have a chat and a cup of tea. With a structured offer of educational classes adjusted to the needs of the local community and motivated volunteers to conduct classes and activities, we essentially will be able to offer what people in the community need. To keep the programme at the SCC interesting and diverse, we invite different new organisations and volunteers to offer their services at the SCC. Paired with the knowledge and experience of our partners at IsrAID we are confident that our services will be appreciated and used by residents, as they have in the past. Are you interested in volunteering in Greece? We are looking for you! In order to offer our services to the displaced, as well as the local community, we need motivated and curious people with ideas and the will to make a small difference with a huge impact. Our Robins on site will welcome you, help you find an accommodation if needed and are your personal contact during your time in Greece. Email us at : meret.balmer@be-a-robin.com . IsraAID - CO-lead of the centre and offers multiple PSS Sessions per week (psychological help). Three Peas - Support the Centre finacially, with donations and volunteers. IHA - Delivers basic nutritional goods for distribution from the center. IndiGO Volunteers - Organizes the flow of volunteers.